There is a sense of relief amongst so many of you who have been following the path leading to Ascension. You have become aware that whatever personal beliefs you have as to how it will proceed, that there is a point where we of the Galactic Federation must fully enter your lives. It has been known for quite some time and the scene has gradually been set for open contact. That is only the commencement of many more that will ensure the purpose of our presence is fully understood. Many already know what is planned, but the vast numbers of people with little or no knowledge will need to be gently informed of what is to come. There have been so many disruptions to your lives already, that our intentions and the authority by which we come needs to be clearly stated. Whatever your personal beliefs, those who believe in a god should be able to accept the idea of the Creator as the ultimate intelligence behind all that exists. Even those who have denied such a possibility, will in our opinion find it easier to accept than those with a set of rigid beliefs. The reason is that the Creator is not tied to any religious organization and simply stands for all that is the Truth. We are those who have gone before you and we come back to enlighten you in all matters, and represent stages of evolution that you are to achieve with Ascension. Consider what drives us to serve you at this time, as it is certainly not for gain, except for the satisfaction of doing a job done well. We are the Creator's representatives carrying out the plan for your deliverance from the dark Ones. Their time as the dominant force has come to an end with the closing of the cycle of duality. If there were no force for good you would continue to live in chaotic conditions without relief. The Divine Plan is perfect and allows for your experience in duality, whilst at the same time limiting its ability to totally overcome you. Subconsciously you know it to be so, as you agreed with the plan when you first volunteered for the experience. You might ask the reason that you should be prepared to undergo such a dramatic change, from the peaceful and happy existence that you left in the higher realms. It is Dear Ones to fulfill that driving force within you, that propels you ever onwards and back towards the Source of All That Is. What we tell you is only a fraction of what we have to pass on to you. The Truth must be made known to each one of you, if you are to have the opportunity to make an informed choice as to whether or not you follow the path of Light. Freewill is your most valuable asset, and we come not to cajole you into doing anything other than what is your choice. However, it comes within the Laws of the Universe, and according to your vibration you will find yourselves exactly at the level where you are entitled to be. Now you will understand that when Ascension takes place, that it can only be for those who have lifted their vibrations sufficiently to be part of it. Not every cycle ends in this way, but this one is the end of a solar cycle that moves you into a new vibration. Because it is universal in nature it means that everything in your Universe must change, and that affects each and every planet, its satellites, their moons and the Sun. The preparation for the great changes has been going on for such a long time, not least of all for your awakening so that you would be ready to accept the wonderful upliftment that would carry you onwards to Ascension. You will observe that so much emphasis is put on this aspect of your experiences, as you are a most important part of the plan. We cannot help but admire your great tenacity to overcome so many obstacles that have been placed in your way, as the dark Ones have tried by all means to prevent your success. It has always been a battle between the dark and the Light ever since your present cycle began. You have all touched the depths of darkness, yet you have arisen above them and now your Light shines out brighter than ever. You have gained strength and purpose from your experiences, which will serve you well in future times. Let no one feel that they have been a waste of time, and any damage to your psyche will soon be made good in the higher vibrations. There is much coming to you in the way of healing once we can safely walk amongst you. Music has proved to be such a remarkable outlet for your emotions, and a great tool of healing. Dear Ones, sound will be one of the most used means for healing and bringing about a balanced and healthy body. Music is a means of expression that can excite you, or bring calmness and peace. It can also have a disturbing effect, as in duality you have the whole spectrum of different levels. As you become more of the Light, you will find that you are drawn to the more pure sounds and these are largely found in classical works. Composers such as Mozart were spiritually inspired, which is why he often awoke from his sleep with a composition already in his head. Raucous and loud music that is a cacophony of different sounds damages your auric body, and can even lead to physical or mental illness. There are two sides to most things that you encounter and that my friends is duality in action. All the guidance you need is within, if only you will listen – but often you dismiss that small voice inside you because it gets in the way. That "small voice" is your Higher Self trying to get through to you, and you would be well advised to listen. You can call it your conscience or intuition; it is a part of you equally important if not more so, than your waking mind. As more of the truth surfaces we note that people are standing up and declaring their Truth, and it will continue to grow as the Light steadily becomes more powerful. For your part you need only be discerning and you will know what to make part of your belief system. I am SaLuSa from Sirius and with time we have been able to be more outspoken, and take you onto higher levels of understanding. It is all part of your education in the higher truths, that you will need to know to understand who and what you truly are in your relationship to the Creator. We are you, and you are us on a never-ending journey through life until you become One with the Source of All That Is. Allow yourself to merge with the Light and Love that surrounds you always, and you will open your minds and hearts to the truth. Those of you who are of the Light, cannot fully receive or enjoy the fruits of your endeavors until Ascension. Meantime however changes will take you nearer to completion, and gradually there will be a clear line between those who desire to ascend, and those who have declined the opportunity. This is inevitable and therefore fully expected, and the consequences of the incoming higher vibrations that lift those of the Light even higher. There will be a co-ordinated plan between our allies, and us of the Galactic Federation and events will follow quickly once they get started. At each stage we shall prepare you for what follows, as it is so important that our actions are clearly understood. We do not thrust things upon you without due consideration as to how it will affect you. Our ways are gentle but firm where we meet opposition to what has been planned. In fact, from some higher levels you are getting much support, as it is seen that without help it would take you many years to overcome the state your Earth is in. Indeed, without the Creator’s plan for your release from the dark, you may not have recovered or even survived. You have no reason to know how near you came to obliteration, but we assure you that on more than one occasion over the last century you came so close to it. Our intervention was approved by the Higher Council to ensure that your cycle was completed successfully. So you will see Dear Ones, that regardless of what was planned against you for your end times by the dark Ones, it was destined to fail in its aim to enslave you. So please make your way towards a New Year of many dramatic and uplifting events without any trepidation. You of the Light are already the victors of a long running battle that has seen many civilizations come and go. Stand firm, and stand upright when you meet any remaining challenge, and let the truth be your banner. In your times on Earth you have had many experiences, which should leave you strong enough to cope with the remaining years of this cycle. At times it will seem hectic, but the object is to clear out that which has no place in your future. There are experiences to come that will be pure bliss, and heaven will become a place that exists upon your new Earth. Imagine how quickly you will recover from your earlier experiences, in the peace and tranquility of the Light realms. It is to be your haven and home where you will create exactly what you desire, and want for absolutely nothing. Do not therefore worry about short-term difficulties or shortages, as our plan will put right anything that is out of harmony with it. You are to receive all that has previously been denied to you, and much more. Global warming is bringing rapid changes to your weather systems, but they will not be catastrophic. Naturally physical changes will occur on Earth and we are aware of what will take place, and are allowed to direct them in ways that will minimize their effects. Be assured that in the end it will all prove to be in your interests, and the world will experience more stable temperatures and variations. It will eventually prove to be temperate and ideal regardless of where you are. As with the Human Race, the animal kingdom will also change and a number of species will completely disappear. They will be mainly those who normally live in the more extreme conditions, and are unable to adapt to the new Earth. They are not lost for all time but will find another planet where they can continue their evolution. All life is immortal and there are no exceptions, and changes take place all of the time as indeed you are now beginning to experience. We know you are just as concerned about your pets as you are your family and friends. They will be looked after with the same love that is given to you, and you will not lose total contact with them. They will remember you as you remember them, and mutual love will bring you together again in the future. Animals are not dumb as some think, and have feelings just as you do. They also seek love and kindness, and can often teach Man a thing or two about them. In recent years you have found that animals can show great love for you, and your wonderful Dolphins are one example of how a species has revealed high levels of intelligence. In the future you shall regain your ability to communicate telepathically with them, as they do with you. As you are beginning to understand, there is much that will change and affect you all personally. However, it is all part of your upliftment into the beautiful dimensions where virtual perfection exists, and all works together in harmony. No more suffering or disunity and instead enjoyment, happiness and fulfillment. You will have time that is yours to spend as you desire, and the Cosmos will be your playground and by then you will understand your responsibility to all life. The thought of all of this may be somewhat frightening and you feel apprehensive, but you will by then be equal to the task of expressing yourself as the God Being that you are, and always were. You the Light Beings are the key to the future of Earth, and through your efforts it can move safely with the minimum of danger to Humanity. You are the beacons of Light that shine out brightly and bring more to it. You will determine how quickly you rise up, and how prepared you are for the final step in the process of Ascension. You have done so well against obstacles that have stood in your way, and we encourage you to maintain those high levels and help everyone around you. Remember that most of you took this incarnation for that very purpose, and now you are here you will want to complete your assignment successfully. I am SaLuSa from Sirius and marvel at your resolve in conditions that can be daunting. You are truly the Warriors of Light, and you carry such a responsibility that it can sometimes seem a burden. Yet you carry your load without complaining, seeing only the great service that you are carrying out in love on behalf of all souls. We are truly blessed to have such stalwart souls on our side, and we shall be with you for the remainder of this cycle, and as your protectors. Is it no wonder our love for you overflows with great appreciation for your service to us all? God Bless you all, and may you receive all that is your hearts desire that is wholesome and pure. Well, good evening everyone! It is so delightful to be here. Ah-Aloha! They did it. Never had we any doubt, but we must recognize, and we do, the fact that this was quite a mission, quite a move, a transition, change, whole new lifestyle, new missions and oh busy, busy, busy. We have so many exciting, exciting moments ahead. Oh yes, they’ll have some time to rest too. You cannot be in a place like this without being inspired to just be very mellow and be very joyful. For those of you who live in places where it is a bit dark in the world now, hang on, we are here, and we will be able to make the adjustment in the world’s weather that we have promised. And they are coming very soon. As a matter of fact you may be aware of the fact that there is a weather station, well it has been used not entirely as a weather station in the past, but it will be, it’s pretty much neutralized now, and its next life will be as one of the monitoring, shall we say keeping everything on even keel, stations. It’s on top of the sacred mountain called Haleakala. And we will be helping from that point. The Kumaras will be there making sure that the world’s weather is a nice sunny 72 degrees or thereabouts everywhere in the world where people want it to be. This is going to bring alive the desert because they won't be cooking any more; they will be conducive to the growing of many crops. The ground itself, the earth, that which you might call the sands of the desert will become fertile growing ground for all manner of wondrous fruits and vegetables and grains and what you call the sustenance of life, and cities will grow up in these places that are barren and they will be alive with joyful sounds of happy Lemurians living in the gardens of abundance and plenty for all. Communities will spring up where there have been no communities before, and those communities which have been somewhat crowded, will be able to spread out. People will be called, just as these ones were, to different parts of the world, for the experience, the expression of whatever they have passion for and just for the joy of living the Lemurian lifestyle. Now we have spoken of the Golden Age, we have spoken of the Aquarian Age. Well, those are names and lifestyles and they are all meaning the same, and because we have a focus here in this land of Lemuria, this part of Lemuria, this heart of Lemuria, we can also refer to it as the Lemurian lifestyle. Now the Lemurians had technologies that far surpass most of what is in place on Planet Earth today because they had their own built in what you call replicators. They could create whatever it was they chose to create. They were highly evolved masters who came to Planet Earth, and it was a Garden of Eden as you call it, and it was plentiful and abundant and everyone was happy and dancing and singing. But as you know the volunteers brought about what you call the lowering of the veil because they had mission and purpose and it was not to have this high dimensional lifestyle forever and ever upon Planet Earth. It was the experience that brought you down in vibrations of being a spiritual being in a human body that was so dense that people often lost touch with who they really are. That is until they laid down their bodies and came back to the other side of the veil. And these volunteers, well let’s just say they are you and you are they, Beloved Ones, because every single one of you has been Lemurian in the past and you have within your wondrous beings the soul memories, the soul of the soul memories, the heart memories of what it is to live this Lemurian lifestyle, this Golden Age. And if you are feeling down in the dumpies, not quite feeling that you are high vibe Lemurians, just be patient with yourselves and understand that you are in a process, you are on a path and the path is the Ascension high road. You maybe just have a little more experiencing to do, a little bit of a pothole in the road, as you call it. And that’s all it is. You are not buried in it, and you will not be buried in it. You can leap out of it, you know that guy in the cape? He can leap tall buildings in a single bound and so can you, and you can certainly leap up and out of a pothole. But it takes focus, it takes concentration, it takes, Beloved Ones, your heart and your wisdom self, and that which you call your higher self, and your inner child and all the wondrous parts of you that you are, all of your bodies and let’s not forget that wonderful part you call your ego. If you have your ego doing a little bit of a tap dance on you, then stop and give it a hug. Be grateful because your ego often times sounds an alarm for you. It often illuminates where you are, and helps you to see with more clarity exactly where you are and then you can clearly point yourself in the direction of where you want to be, if you are not totally pleased with where you are. And so we suggest to you that if you are feeling a little unclear, a little down in the dumpies, get with yourselves, and with the wondrous guides and angels that you have there for you and if you have not introduced yourself to your team, do it. You each have a marvelous team and because you are who you are Beloved Ones – Volunteers - who’ve been here many times, who have lived all of the different experiences you could possibly cram into a thousand or so lifetimes, you are ready and you have understanding. You have understanding of the experiences and the emotions that have come about, or shall we say, have guided you through these experiences, and so you have the love-based emotions, and you have the fear-based emotions. And you have all chosen, we’ve done some scanning you know we always show up a bit early, and while all of you were saying ‘hello’ and coming on to the call, we did a little scanning and we want to tell you each and every one of you is headed for Ascension. There’s no doubt about it. And you are all beaming, Beloved Ones. You may not feel like a beamer at this moment, you may have a bit of a headache or a tummy ache or you may feel as though you’re down in the dumpies a bit, but you all have your beaming lights on and you all have your loving teams with you ready, ready to step in and connect, communicate and commune with you. So focus in that direction and know that all is in perfectly divine order in your kingdom. Don’t fight it. Don’t say yabbit, yabbit, yabbit. Say “OK I accept and allow that all is in divine order, now tell me what to do. Clarify, communicate with me and by the way, I can use a big hug. So let’s get into the communion state too. I want to be One with the All I AM and with all who are here to help and guide me along my way.” And you know that I, Ashtar, am always ready to discuss with you what it is, well we have a little technology to set up and get set up before the Voice can do those things [since the move to Maui], but you know what, try calling on me outside of this discussion and see what happens. And then if you want to, in a couple of weeks she will be back and able to do some discussions on the telephone from Lemuria. How about that! Now we have many, many items to bring up tonight. So we are going to do a little bit of skimming over the top as it were. First of all, and you are hearing it here what you have already heard. Confirmed, confirmed, confirmed! Yes! We like to answer the question before you ask the question, but we know you are all asking the question, “Is this for real? Are we really on our way this time? Are you guys really going to get announced before the end of the year (as the calendar flows in your time)? What other questions do we have that we have just answered. Yes, we are looking at big, big changes in the entire financial structure of Planet Earth. They are already in progress. They are already in place. If you could see what we can see. There is a curtain, just imagine a curtain, you are looking at a stage and behind the curtain are all of the banking computers, practices, and oh, lets not forget the bazillions of dollars that are there in the form of gold, silver, platinum and other things that you regard as being valuable. Well they are. They do have value because they enable the shift that is happening. So if somebody calls you up and says “I’m afraid I am going to lose all my dollars in oh, you know, that bank, one of the banks that have been owned and controlled by the dark hats”, please do assure them their money is safe, their dollars will be replaced with dollars that are backed by these things we call the precious metals. It might get a little rough and bumpy and a little cash in a very secret hiding place, and we are not talking about under your mattress, but you know use your imagination, but a little bit of cash for a little bit of time, hmmm, no dates of course, would not be a bad thing for transitional purposes. But you do not need to panic. You see the thing of it is, because you have given us permission we are here to partner with you, these changes while they may be sudden, while they may take a good part of the world by surprise, but not really because they’re that part of them that they’re not really in touch with now, knows and sees and has already accepted and called for the changes, facilitating Nesara to move forward, and Lady Liberty, hand in hand, and Lady Master Nada is right on top of the removals that have to be taken care of in order to make this seamless - well it’s going to be as close to seamless as we can possibly make it. So you have been given some information tonight - treasure it. You have a rather unique place in your homes on your telephones that gives you access to this and if you are not buzzing with it, check it out, do your testing, or call upon your group, check it out, be sure that you ask for the highest of truths. Get out Excalibur if you want to and wave the blue, the Blue Ray of Truth, and start asking some questions and verify for yourselves and confirm and then look anyone in the eye who says, "Oh woe is me, the economy is in the dumpster and they are going to toss me with it," and say, “Let me tell you something, I have some good news for you. I am a Messenger of Truth, and Love and Peace." And then say whatever it is that you feel inclined to say. Intuition, Beloved Ones. That’s a great word. Intuition. Follow your guidance, speak your truth. And if you have a question that you want some clarity on, we have just said it, we will say it again, get in touch. Because you need to be in assurance. You need to be standing tall and know that what you are projecting to the world is the very highest of truths. You are Lemurians, Beloved Ones. We are living Lemuria and we are here to stand tall for the world and to beam the lights of Truth and Love and Joy and Peace - Peace that passeth all understanding. It’s your gift to the world. You came here to be in expression of this truth, and no matter where you’ve been in this lifetime or others, no matter how rough you may feel your life is at this moment, remember, and remember that you are loved beyond words and you are never, ever alone. Ever. Be the Joy that you came here to be, and let others be uplifted by your joy, by your love and by the truth and the peace that you project, and some excitement is perfectly appropriate because these are the most exciting times ever seen on Planet Earth. Planet Earth is accomplishing what it has never been able to do before and it is because of you, Beloved Ones, because you are here and our hearts are full in joy and love with you. And because this is such a happy, happy joyful time for Planet Earth, let’s have a little joy ride tonight, shall we? Now most of you have already been well-acquainted and oriented to your crystal elevators. But we will just start right at the beginning. This is going to be a very interesting exercise. So if you will just take some deep breaths. And if you will just open your wisdom eye and see in front of you a beautiful crystal elevator. It sparkles and shines so much that you are immediately drawn to it and as you get close you will see upon it your name, right there. This is your own elevator. Each and every one of you have your own private one. So we invite you to come close and as you do the door opens automatically, you don’t even have to push any buttons. And you see inside how it sparkles and shines and you just want to come in. And it is such an inviting space so warm and so beautiful. You may feel a little cool breeze, you may feel a little warm. Just come on it. And feel the joy of being here. You may hear some beautiful music or see some glorious colors reflected from the walls and the ceiling and the floors which are all crystal. No need for any artificial lighting here, not even a candle here, it is so bright and beautiful. So allow the door to close and just let yourself know how secure and safe you are in this wondrous elevator. Now the elevator knows where to go so you do not have to direct it but you may notice something. Whereas before the elevator normally goes up to access other dimensions, this time it seems to be going downward, and that is interesting, but remember there are other dimensions downward as well as upward, because they’re here, they’re there, they’re everywhere and wondrous beings, inhabitants of those dimensions you call the higher ones, but that’s just a numerical ordering. And so allow yourself to go in your elevator and just be happy and joyful and kinda getting into a bit of a high vibe state, shall we say, even higher than when you entered the elevator. And now when you open the elevator, it’s a crystal tunnel and you are invited to walk through this tunnel. It’s very short, there is a lot of light at the end of the tunnel. But a door closes behind you which is most necessary, and as you reach the other end of a tunnel, a door opens, and you are in the sea. Precisely under the water of the sea. But you can breathe, and you can swim, and it is a most delightful world, and you can open your eyes, and it is a most vibrant sea and there are all manner of wondrous creatures there to greet you. And they are so delighted to see you, and you are delighted to see them, and you don’t need your mask and your snorkel and your swim fins or any of that, you don’t need your wetsuit or your little yellow submarine. They invite you to come out into the waters which are the most beautiful shade of turquoise blue and all of the creatures there seem to have a special sparkle, and the colors are beautiful and they seem to be leading you to a very special place. It’s what you call an underground grotto. It’s kind of like an amphitheatre. And you swim easily over the rocks that form the circle of the grotto and there is your welcoming committee. Your own special dolphin guides are there to greet you, and you can hear the wondrous music of the sea and the dolphins invite you to swim and to dance and even perhaps if you so desire to have a little bit of a ride on the back of one of them. And it is the most joyful reunion because you see the dolphins are family with you as well, and they welcome you because there was a time in that Lemuria long ago when you actually swam and danced with the dolphins quite freely, quite easily and you know them to be wondrous creatures, wondrous messengers and communicators. And they communicate with you and give you messages of Love and Joy and Peace on Earth for they know who they are as they always have known, and they have been on Planet Earth since the beginning. And yes, they have had some difficult times, but they bear witness and they have never ceased their great love for you, their love indeed just grows more and more each day, and that is why you can be close with them and commune with them, and understand them and tell them what it is that you want them to hear from you. So just take a few moments. Blow some bubbles if you like, bubbles of joy, dance and sing and commune with these wondrous dolphin guides of yours, and be One with them in harmony, in love, and in joy of the moment. And if you have felt a pang of separation in the past, heal it, and so it is. Because now you know of your Oneness with these magnificent creatures, and through them your Oneness with the kingdom of the whales and indeed all of the creatures of the sea and with the elementals who inhabit the sea, the mermaids and the mermen and all of the other wondrous ones that you thought perhaps were imaginary or in a different world, that you have come to meet with them and to commune with them. So they are all here. So hugs and joy bubbles all over. Dance and sing and celebrate this grand reunion, this return, this homecoming to that part of Lemuria which you have for the most part not accessed for eons of time. And be in joy and know that all you have to do to return to this magical kingdom beneath the sea, is return to your elevator, and so it is. Because you have been celebrated, your coming has been long awaited, and now when it is time to leave this magical place, you know how to get back any time you wish, and so you can assure this wondrous, wondrous family beneath the sea that you will return to dance, sing, love and hug and commune at any time that they call you or at any time that you choose to reach out to them. And so as you dance your way back to that tunnel you see that the door is open and waiting for you, this wonderful tunnel of light, and you go through the door and there you are at the other end where the door opens just as the other one has closed behind you and there you are back at your elevator having had a wondrous adventure. And now you can come back in your elevator to the place where you began loving and savoring this time, this reunion. And thank yourselves, Beloved Ones, for having the courage, the heart and the love to come back to this part of Lemuria and to reactivate the energy of it within your entire beings, you can know it your heart and in your wisdom space. And return whenever you choose. And so now as you come out of your elevators, just take some time and breathe and relax. This was an expansion for you, a reaching out to another place where you had not been for some time. So just expand with it and for those of you who have had the experience before of swimming with the dolphins know that this was a reunion of even bigger, bigger grandeur, because it solidified your relationships or shall we say reopened them, reenergized them with these wondrous kingdoms beneath the sea. And so come back at any time you choose. And I, Ashtar, thank you for joining in with this and for bringing your light and receiving the love of the kingdoms beneath the sea. And so now we have another speaker who is waiting for you, and so, Beloved Family, I shall say farewell in this moment. But remember that I, Ashtar, and the entire Ashtar Command are with you always in loving service even as you are wondrous beings of love light in service to all of Planet Earth and indeed the universe beyond. And so it is. Salute. Good evening. It is I, St Germain, and I come to congratulate you all. Well done, citizens of Planet Earth and indeed of the Universe. That which has been spoken of this evening is truth and there is more. You have co-created a marvelous canape of adventures and excitement, of wondrous historical times and of times not so joyful as you have indeed traveled upon Planet Earth and in other places. Your reward is NOW. Your return is NOW. We are speaking of your homecoming. We are speaking of your realization of this citizenship and the honoring of you for all that you have accomplished. You have enjoyed freedom the entire time though it may not seem so from your side of what little remains of the veil. You have all served as slaves, bound in some manner. You have all served in prisons. You have all suffered, been tortured and killed for your expressions, for your beliefs and for your cries for freedom, you have all been at some time or other what you might call Freedom Warriors. And if you think that those expressions were in vain, think again. Because of you, because of your efforts and your actions, you have kept the light of Freedom alive upon Planet Earth. Because you volunteered to be a Freedom Warrior, you are now a Peace Bringer to the planet. Lady Liberty stands ready to come fully upon the stage in all of her luminous glory and she does so with great joy and appreciation to all of you for what you have done. Now I want to share with you a little bit more of the banking situation. As you all know I have had many lifetimes and identities upon Planet Earth and other places, but what is important now is that I set up this Trust when I could look through the centuries, because when you have an ascended status you see past, present and future all as one. And I could see that I needed to start what I called a Freedom Fund, a way to enable freedom for the citizens of Planet Earth so that they would be free to follow their paths of joy. You see, the Earth evolved in such a way that when Lemuria was in full bloom, there was no such thing as money, nor was there need of it. But there became in actual usage, various mediums of exchange, items that were valued. Salt is a good example, and we are talking about true salt, not what the chemists have given as salt. And you have access to true salt today and it is rich for you. Gold - gold was much prized all over the planet. Not always as a medium of exchange, sometimes it is prized for its beauty and sometimes for its healing powers in a certain state, called the high-spin state, and so on. Gold has been prized upon this planet for a long time. It was the gold of certain ones, bankers and their families, to own all of the gold, and by doing so they felt certain they would own the planet. So I started a fund. That fund is rich beyond what most of you can probably imagine, and thanks to the Kumaras of Venus and others from other places, we have brought in sufficient gold such that every man, woman and child upon the planet will have so much abundance that they will fast get to a place where they won’t need it any more. Imagine. Just imagine. We have talked about the desert blooming. The people will bloom and thrive and prosper. Gold has healing capabilities as do other precious metals. We have technologies to utilize in the form in which they can help people to heal, in which they can energize the planet, power the planet if you will. And yes, they can be used to create beauty, and just to sparkle and shine. If you want to wear it, if you want to decorate with it, if you want to pave your streets with it, except that there won’t be much left in the way of streets, but rather walking paths. But you can decorate the streets with it anyway. Imagine unlimited gold and other precious items. Your bodies are changing to the crystalline bodies. Does that give you an idea of how precious your bodies are because you prize crystals as well as gold, and they are precious. And many people pay many dollars or gold to possess various crystals and here your body is becoming crystalline. But there will be no need to weigh you and to say that your value is so much an ounce. Your bodies will be utilizing what you call the monatomic elements in the high-spin state, well let’s just get right down to it, that’s gold and other precious metals in a different state. You will have access to all of this and more. Because the truth of it is, it’s all here. Its like the bank computers behind that curtain that we spoke of. They are all there and they are all ready and it’s a matter of pushing a button and I, St. Germain, have my finger on that button at this moment. Lady Master Nada is leading off with the activities at The Hague. And we ask that you empower these activities in any way that you feel most comfortable doing. Many of you are familiar with the healing of Ho’oponopono – it’s very simple. Many of you are starting to get to your Q-tipping in the Q-tipping way. Q-tipping the Q-tipped areas and you know that you might have a little bit of anger or resentment toward those you call the dark hats or the Illuminati, or their leaving the stage. Long ago Ashtar spoke of the man just at the edge of the stage, back stage, with the hook, to take anyone off the stage that the audience was not appreciating, that is, did not appreciate the actions of the players upon the stage. Lady Master Nada has that hook, it’s called a shepherd's hook, but just imagine that it’s big enough to corral all of the players who have insisted upon staying upon the stage, and they are being drawn off gently but firmly. And so as they go, we ask that you give them a final applause, a final burst of love beams, a final gratitude because you are so aware of the differences and the changes that are coming about as a result of the blatant way in which they have acted. The clarity that you have about their actions, to be without judgment but simply to allow them to leave the stage with the grace that you can extend. So take a moment to say, "Thank you. Your darkness has stunned me for life. I give my light to you if you choose to accept it, and I send you off without anger or hatred towards you. You played your part, and indeed you have over-played your part, but all is well and divine and I stay where I am standing tall, a warrior for freedom, a peace-bringer to the planet, a loving being in full expression and beaming. You go your way, I AM on my path and you have not taken me from it. And I now see the way to Ascension quite clearly, and I thank myself for being here at this time and for being a recipient of the gold and all of the abundance that has been prepared for me during these centuries, these eons of time." And if you can do that, Beloved Ones, you are living the teachings that I, St Germain, the one you call Jeshua, Sananda, the Buddha and all of the others have brought to Planet Earth. So now get ready, you might wish to give a standing ovation to those who are leaving, and you might wish to leap for joy as the curtain is about to re-open on that which you call the Golden Age, the Age of Aquarius, Lemuria Living. Thank you, Beloved Ones, for being with us in this great venture. It is you who have made it possible for the Bank of St. Germain to open in this grand time on Planet Earth. Beloved family it is I, Kuan Yin, and I come to add my words to that which has already been spoken. I ask for your Compassion for these ones who are leaving the stage. I ask that you remember that they too came in mission and even though their mission may have been hurtful, painful, and even a terrifying experience for you in many of your lives, you have prevailed, the sun shines bright, and so I simply say, Beloved Ones, forgive and express gratitude for these ones who are so over, done, on Planet Earth. Send them off with Love. They may not want to accept it. They have clung to their programs in defiance of all of the Love Light that you have been generating but you, Beloved Ones, are shining brighter and brighter, and some of them have indeed taken off the hats of the dark and are now shining with the lights of love. Bless them all and if it helps see them as little children even as I see all of you shining pure, I see your inner children and you are all so beautiful, Beloved Ones, and it is such joy to be here with you. We are here now, here on Planet Earth, walking hand in hand with you and joining heart to heart. So let us join together in heartfelt gratitude, love, forgiveness, from our compassionate hearts to reach out and to say farewell to these ones and let us say "hello" to Lady Liberty and Lady Nesara and yes, to the grand opening of the Bank of St. Germain, and to all of the Love and the Peace and the Abundance and the pure Joy that results. Thank you, Beloved Ones, for opening your hearts. We are One Always. And so it is. Namaste. As your levels of consciousness continue to grow exponentially, you are effectively lifting others up with you. This is resulting in rapid changes in your mass consciousness, and you are able to cut your ties with the lower vibrations more easily. As you do so it is taking away power of the dark Ones to hold people back, and they can awaken to their true selves. The dark Ones have systematically made you feel inferior, and reliant on their support and direction in your lives. In so doing they have controlled you for their own purposes, and kept you from the truth about your creative powers. However, you are learning quickly that your future is in your own hands, and denying them further control over you. You are claiming back your rights to freedom from their oppression, and helping create the energies for change. What you now see is a chaotic state on Earth, yet out of it shall come the new energies that will speedily raise you to new levels. So, we can talk of First Contact that is coming as the result of your dedication to overthrow the dark Ones, and foil their plan for your enslavement. You Dear Ones over many lives have been coming to Earth with the intention of bringing Light to shadow world. There has always been a long-term plan to help you rise up, and many of you here today have been responsible for the success in changing the balance in favor of the Light. It is really only in the last century that you have achieved a massive breakthrough, and it set the stage for the final thrust towards total freedom. Success may still feel as though it is far away, but with the full co-operation of the various councils that oversee your evolution, it is much nearer than you could imagine. You chose to be here to experience it, and be part of the final chapter in the cycle of duality. Many, many souls sought such an opportunity, but your presence means that you were more suited to the occasion and brought with you a wealth of experience. The dark Ones have no real answers when competing with the Light, and for a long time feared the success you have achieved. They knew it was inevitable, but true to their colors they obstinately refuse to recognize their demise. Is it not ironic Dear Ones, that they are now the ones who are in a state of fear after having used it as a weapon against you. We may frequently refer to the Dark Ones but we do not judge them, and that will be left for their own self-judgement when their time is also finished in this cycle. We would ask you to be forgiving, as would be expected from those who have moved into the Light frequencies and carry the truth with them. All souls are equal and loved by the Creator, who does not punish the errant ones as some believe. Each of you has had experiences of the dark and Light, because that is the reason you entered this cycle. Experience means progress and is your pathway back to the Light that knows no equal. You have so much to learn, and Ascension will be your first major step towards a true understanding of your purpose for being here. You will also learn of the continuing plan for your greater evolution in the higher realms. You are not afloat like a cork aimlessly bobbing up and down in the sea, but have a clear course mapped out ahead of you and we shall steer you towards it. You are quickly awakening with a good appreciation of where we fit into your lives. We have been with you all along, and with our coming openly with prior announcement you will soon accept that we are one family within this Universe. All life is interconnected from the consciousness of the smallest particle to the complete Universe, and it is revered for that reason. It is therefore sad to see how some of you view other people as different simply because of their appearance or beliefs. Allow for freedom of choice, as each has chosen their own place and time for their experience. Help each other as you would your own family, and soon there will be a totally new feeling of Oneness. You are capable of it and more, but your feelings have been frozen out by your experiences at the mercy of the dark Ones. A new day is opening up when all shall start to change at a pace that will surprise you. Everything has been planned for a long time for this very occasion, and there is absolutely nothing that is beyond our handling abilities or resources. We know that some of you question it, as you are not familiar with our advanced technologies or our high level of co-operation with our Federation members. Most of you shall see it all come true within your life span, and it will be as if the nightmare has turned into a pleasant dream. It will be more of course, because we are talking about your reality and uplift into an entirely new dimension of Light. Truth is stranger than fiction, although your authors such as Arthur C. Clarke were inspired to incorporate true facts in their stories. Over a long period the battle for your minds has been at this level, and it has been necessary to overcome the fearful stories about Space Beings with series such as Star Trek. In the end you decide what to believe, but with our coming there will have to be re-think on the part of many of you. You will quickly find acceptance of us, as our intentions will be seen as peaceful and for the good of all. Be of good cheer, and when the opportunity arises share your knowledge about coming events with those who express some interest. Try not to flood someone with too much information at the time; it may otherwise cause them to ignore it all. We can tell you that the consciousness levels have risen much higher in the last year than any corresponding period. They will of course continue at an ever-increasing rate, and those of you who are sensitive to them will register the difference. We can record the levels so we can assure you that there are enormous advances being made, and exactly as we expected. I am SaLuSa from Sirius, and have learnt so much from you about Human’s and their ways. There is nothing like first hand experience which is why you have entered the cycle of duality. You may wonder why you did so, but for a real evolutionary step of some significance there is little that will match it. It will be so wonderful when you hang up your duality hat, and we shall be with and join your celebrations. Keep your sight on your goal and never look back. I think what you have touched on here is a fundamental psychological-warfare technique which the Cabal media manipulators long have used: a potent combination of many people's aversion to reptiles along with old-fashioned racism. Putting the two together is an "unbeatable combination" from the Cabal's point of view. All they have to do is create, say, a science-fiction horror movie (like Independence Day or "V") featuring horrible-looking "aliens" and even "better", aliens with scales, claws and slit-pupil eyes, and then have those "aliens" run amok among humans, and presto! the scene triggers in susceptible people deep feelings of aversion and hate based on "they don't look like real folks look" and "they're creepy and no good", and thus it is a tiny step to "let's kill 'em all!" This same trick was used by military intelligence propgandists in World Wars I and II to get the American public to see German soldiers as "the Hun" or "Krauts" and Japanese soldiers as "the Yellow Peril". Are we ready as a Human species to grow up beyond such primitive manipulation of our subconscious emotions? This 11:11 portal is especially powerful, for it is in effect an 11:11:11. The triple energies represent an activation point for the energies of the Divine Christ Light. At this time, there will be an “explosion” of Radiance, and you will begin to activate the Rose Stargate or Portal that will be your connection point to the Cosmic Consciousness. Now, you begin to unfurl the “petals” of the Rose within your energy field and to form or create the Auric “stargate” that will allow you to access the Cosmic Light of the “One” directly and as a Collective. As you begin to formulate this coherent pattern of Beauty within your energy body, so the Planet also begins to create this stargate beginning over that region that you know as the southern pole. Let us explain it this way. The Grail Codes of Light activate the potential within your physical being to carry the Golden Flame of the Christ Consciousness. This is also symbolized by the Golden Chalice. You, yourselves, in your enlightened physical body, are the “chalice” that holds the golden and infinite light of Spirit. The Sacred Symbol for the Ascended Christ teaching is the Rose within the Chalice. Beloved Ones, the Rose is your Light Body Spinal channel, culminating in the “Flower” of life, the Rose Stargate that connects you to your Divinity and the Divine Cosmic Consciousness of the Cosmic Creation Matrix. This Rose, or in the eastern tradition, the Lotus flower, opens to create a portal to Cosmic Consciousness, and it was known to the Ancients to be a part of the “design” of the “Divine Human” or Human Angel. Many of the ancient spiritual practices were designed to ascend power up the spinal channel of light and to open the “blossom” which was the Sacred Geometric Portal known as the Rose Stargate. This flower design was encoded into the great cathedrals of France, such as Notre Dame de Chatres, that honored the life and teachings of “Our Lady”, the Feminine Christ Light of Mary Magdalene and her partner, Yeshua ben Josef. And so, Beloved Ones, the Sacred Rose of the Flower of Life is the Cosmic Stargate that you will begin to formulate and “unfurl” in your Soul Star energy field, as you and your Planet are rebirthed and restructured into the Great Cosmic Rose or Flower. This is the Geometry of the Stargate Harmonic that will facilitate your final ascension into the Cosmic Heart and Mind and the full Creation and Experience of the New Earth. At this time of 11:11:11, those of you who are ready will begin to create the Rose, or “unfurl” the “petals” of Light that will coalsce into the Rose Stargate of Cosmic Light and Consciousness. Dearest Children of Light, know that you are Loved. Know that this beautiful Rose of Light will be the Spirit and Soul vehicle that will lift you into Cosmic Consciousness. We celebrate with you the opening of the Rose….the Flower of Love. Feel how this restructuring will open you to the Cosmic Creation Matrix, the Great Womb of all Creation. You will know, as I knew, your own Divine Essence and you will become One with the Divine Light of Creation. You are Loved. You are Beautiful. You are Divine Light. You are the Sacred Rose! Tomorrow, President Obama will be leaving for a trip to China. There will be talk about the World Bank. The old timeline is coming to an end. In order for the old timeline to dissolve, all institutions, including banks and the stock market, must dissolve. Once torn down, a new system may be introduced. You have seen many messages about 11:11 being a portal, a place to get your individual house in order. Globally, it is a portal to call it quits to deals written on bad paper. Real Estate sales, Stock Market Futures, Taxes, Currency with no base, Utilities, False imprisonment, are a few examples where bad paper has been used for illegal scams. When the Chinese call in the loans, they have given around the world, it will shift everything. It will resemble a house of cards falling quickly. There may appear to be chaos for a short time. One of the reasons for the wait in decloakings, is so every single minute detail can happen as fairly as is possible. Timing is everything. There is no reason to have one group or another in a hardship. It is better to wait and allow all issues to be handled in a fluid manner. Arrests, Decloakings, Announcements, NESARA, Mass Landings, in that order. The trip to China has been planned for at least a month. The Dalai Lama visited a Chinese border town a few days ago. China holds an important part of the puzzle piece. There are many needs in China for everything. The Communist regime has made life difficult for her citizens for far too long. The relief these Souls seek is here now. Not only is this meeting about dissolving the old financial system, it is also a signal to a large group of Earth Citizens. The President of the United States will be attending life changing meetings. He will be organizing the Plan for including the new leaders who will take over when the Chinese Heads of State are arrested and new ones will be put in place. This is all about Disclosure, Disclosure, Disclosure. The last bit of the Master Plan is coming into play. Since there won't be any Update this week I will fill you in on what was covered this weekend with Sheldan. At least 3 or about 1/2 of the new chakras have manifested of the new 13 chakra system anchored in. The U.S has 5 times as many prosperity recipients as Canada followed by Australia & then England. The Fed[eral Reserve]. is running out of money & the new budget is overdue, so bankruptcy is most likely before NESARA [National Economic Security and Reformation Act]. This being a matter of days, weeks or months & most likely this year as the creditors implement NESARA. Europe, Russia, China & Japan & many others are fully cooperating with the Galactic Federation & Earth Allies. + 40 years of back taxes will be returned from now back to the end of the Vietnam war. All prisoner cases will be reviewed & resentenced, the innocent to be released immediately, this massive review has started already. Everyone will experience Abundance & holograms will do the work where needed to fill-in on any jobs. Buy whatever goods & services you desire, take a brief vacation, get a new car, house or whatever you want. Once deliveries take place the new transitional gov't will be implemented for 6 months then elections will follow. Within 6 months a 2nd funding will open to all not in the 1st prosperity funding to payout 30 days following that. There will be virtual tours of the Motherships on TV, etc & Inner earth tours will be offered to various leaders. Full disclosure & flyovers will come a few months after Announcements when prosperity is commonplace. New elections will take place 6 to 8 months after Nesara, also the 10,000 u.s military bases will be shutdown. The new technologies will include sonic showers which clean our skin & soften it by sound in a minute or so. Our clothing will sense temperature & adjust by warming or cooling us & changing fit as we wanto relax. We are the new hybrids having special & unique abilities as each group like the Lyrans, Sirians, etc, have. 12 to 14 months after Nesara announcements the metamorphic chambers will transition us to the 5th dimension. Of course this is a general succinct overview of the weekend seminar....Much more was included. You can get up to snuff on the Webinar next Sunday & Thursday following as Sheldan's birthday is tomorrow 11~11 & joining us on the webinar is a Great Present & appreciation of his dedicated work benefiting us ALL. Also our participation increases the Galactic energies enfolding the Earth & brings them measuredly closer to us in time as well as space & shows the Masters we are ready & wanting to Participate & Change Quickly, Oh So! KOS ~ China has purchased a great deal of America's debt. They are aware that the arrests have happened. They saw this as a potential for the last few weeks. This is the change they have waited for. The Chinese are aware the truth will be revealed about 911. They are also aware that the Galactic's are waiting for Disclosure. This combination of potentials will have the Chinese Leaders demanding a call in of the loans given to the U.S. They mistakenly believe this will turn them into a SuperPower. The Chinese have been plotting this plan a long time. They have been encouraged to make this mistake. They have been deceived. No one would gain from the chaos that will result with all the banks publicly closing. As we speak, actions are being put into play which will change the outcome of the meeting. The Chinese do not yet know it, but the agenda of the meeting is going to change far before President Obama reaches China. In Tokyo, key figures will join with the President and PM Yukio Hatoyama including President Medvedev, Chancellor Merkel, and others. This meeting will bring out truths into the public spotlight. There will be some surprises. At the Singapore meeting, where 21 World Leaders will be gathered, more surprises will come down. As the APEC Summit convenes, there will be talk about a new economic plan not discussed before, which will effect the entire World. This news will over shadow China's plan for calling in loans. Ashtar ~ There are meetings tonight North of Alaska with a large portion of the GF members. Final plans are being agreed upon, and arrangements are being made. The news is not covering this leg of the trip. Some members of the Press will be there. This is the beginning of disclosure. It would not be fair to have one world leader responsible for the News, it might be more fair to reveal it in a place where more than one World Leader has gathered. If Disclosure occurs with the President of the United States, out of his office, it will fend off any chances of accusations against Mr. Obama. With a large number of World Leaders together, Unity, as One Race, begins as it should, with everyone in it together. We have informed you that it is time to reveal the truth about us, and our activities on your behalf. The time of revelations you refer to as “Disclosure” is so to say “on the table”, and it will open a Pandora’s Box of information. Once the initial announcement has been made, it will bring out long hidden truths about the Galactic Federation members. It will also reveal the truth about other visitors to Earth outside of our membership, and not necessarily of the higher levels of Light. Naturally a young civilization such as yours attracts a lot of interest, and it is permissible for visits to be made for the purposes of exploration and scientific information. However, there are strict laws of non-interference, and they have to observed. As you have grown over thousands of years, the colonization of other countries has been enforced and mighty empires have emerged. The colonization of Space has stringent and enforceable controls, and can only take place with both sides in agreement. Clearly there are many benefits to be gained where a more advanced civilization joins hands with a developing one. Your Earth is in such a position now, and your potential to be able to join the Space Family commenced when you raised your consciousness levels. It was known that you would rapidly progress towards Space travel, and now you go back and forth to planets in your Solar System. Inter Stellar travel would be a natural development from there, but until you put down your weapons of mass destruction, you will be prevented from doing so. It is true that there have been Galactic Wars, but as time passes so soul progression takes place and peaceful co-existence becomes more wide spread. The dark forces upon Earth have had ambitions to enslave you, and extend their activities into Space. They already have bases upon the Moon and Mars, and using force they would not hesitate to colonies another world. However, no matter what they do they will not be allowed to go outside your Solar System. Nuclear weapons are quarantined so that they stay on Earth, and not allowed to be used in connection with experimental or warlike activities. You might wonder where the negative influences have come from that have plagued your planet, and we can tell you that they have always existed in your Universe because of its dual polarity. When the vibrations of your mass consciousness drops very low you attract similar ones from outside, and as a result powerful energies are formed that make them harder to overcome. We are pleased to tell you that as a result of your highest intentions for good, you have suddenly lifted out of the depths of darkness. Hence, you now move even further away and into the Light that is your path to Ascension. There is so much truth in the expression “as above so below” and this is why your upliftment into the higher dimensions, will find you at home in surroundings that are acceptable and familiar to you. As a collective of human souls that have originally come from all quarters of the Universe, you are a microcosm of the macrocosm. Therefore although dramatic and far-reaching changes are coming, they will be a natural progression in your greater path to Cosmic Consciousness. You are special and well loved without a doubt, and why not as we are all involved together in our journey through Space. The changes will be enormous and exciting, and whatever your experiences now they will be eclipsed by those that are to come. We find that there are far more people who are now settled in peaceful self-realization. They walk their life without fear and carry their Light with them, raising the vibrations around them where ever they go. The Light has formed a network of souls that are unknowingly spreading it across the Earth. It is growing exponentially, and is a great force for the good of all other souls. As we often suggest Dear Ones walk in the awareness of your Light at all times, and your mere presence will lift up those around you. Everything is going well and much happens behind the scenes of which you cannot yet be aware. Our allies slowly but surely make inroads where there needs to be changes, and wait our go ahead to implement our plan. They are often in vital positions that are essential to success, and for the time being secrecy is necessary about their activities. Our craft are often placed in such a way as to protect them, and our presence is unknown because we are cloaked in invisibility. Many craft already peer in to you world as they monitor the dark Ones and their whereabouts. We have the thousands of nuclear devices under our control, and you may rest easily as they will not be allowed to be used. The dark are far from having it all their own way, and we play by the rules where they do not. We are highly organized, and they are in disarray because it has long become apparent to them that they cannot win the battle between the dark and Light. There is a new sense of achievement amongst Light workers, as they now feel the changes in the vibrations and realize that upliftment is well under way. These last few years have seen remarkable progress towards Ascension, and more souls are awakening to their true potential. With the advent of Disclosure and the revelations that will soon follow, we expect even more souls to come out of their clouded view of life. No one really likes to feel that they have been deliberately misled yet it has been going ever since the collapse of the Atlantean civilization. From that time you fell into an abyss of darkness, and those seeking self-power took advantage of the situation. As this cycle now closes you will look back, and realize that you have gone through so many karmic periods as a Human Race. War and the threat of war have never been far away, and after some of the bloodiest wars in your history. You have said, “enough is enough” and moved your focus away from them and on to the path of peace. Your leaders are slow to respond and opposition to changes is strong, because of the profitable industry that has grown up around them. I am SaLuSa from Sirius, and can tell you that you have called for peace on Earth, and we are here to ensure that it is achieved. It will be part of our plan for you and your salvation, and negotiations will commence once we are introduced to you. Love and appreciation of each other will quickly return. Massive GeoMagnetic Storms down two Airliners:300 Casualties result. Air France and Yemeni Airliners involved. Reports circulating in the Kremlin today are saying that Russian Air Force Commanders have issued warnings to all of their aircraft to exercise ³extreme caution² during flights ³in and around² an area defined as Latitude 17 North [North Atlantic Ocean] Latitude 3 South [South Atlantic Ocean] to Latitude 8 North [Indian Ocean] Latitude 19 South [Indian Ocean] between the Longitudes of 46 West, 33 West, 46 East and 33 East, and which covers the greater part of the African Tectonic Plate. The reason for this unprecedented warning, these reports state, are the rapid formations of ³geomagnetic storms² emanating from the boundaries of the African Tectonic Plate that due to their intensity have caused the loss of two major passenger aircraft during the past month leaving nearly 300 men, women and children dead. The first aircraft to be downed by this phenomenon was Air France passenger flight 447, and which these reports say that upon encountering one of these geomagnetic storms, on June 1st, near the western boundary of the African Tectonic Plate close to Brazil¹s Fernando de Noronha Islands, was ³completely annihilated² causing the deaths of 216 passengers and 12 crew members as their plane plunged in pieces into the Atlantic Ocean. The second aircraft to be downed occurred on the eastern boundary of the African Tectonic Plate today when another of these geomagnetic storms slammed from the sky a Yemeni Airways flight to the Island Nation of Comoros in the Indian Ocean of which of the 153 passengers and crew aboard, only 1 ³miracle child² has been rescued, so far. ³Although the birth of an ocean is an extremely rare phenomenon on the largest of historical scales, the geophysics is currently experiencing such an event. Even more dazzling, this occurs in one of the Earth's most inhospitable and arid regions, the Afar Depression in Ethiopia. Though Western scientist assert that the formation of this new ocean is not likely to be finished for millions of years, Russian scientists state, unequivocally, that due to the Suns current unprecedented Deep Solar Minimum, our Earth is in danger of being, literally, ³ripped apart², at the worst, or nearing a ³total pole reversal² due to an as yet unexplained, but extremely powerful, gravitational force emanating from the outer reaches of our Solar System that some researchers state is the mysterious Planet X, and which many believe to be a large brown dwarf and known to the ancient peoples of Earth as Nibiru, and called by the name of Wormwood in the Christian Bible. Russian scientists further warn that the West¹s ³obsession² with manmade Global Warming is a deliberately designed propaganda effort to shield their peoples from the fact that not only our Earth, but all of the planets in our Solar System are currently undergoing rapid warming, and as proved, beyond all doubt, by Doctor Scientist Habibullo Abdussamatov, head of space research at St. Petersburg's Pulkovo Astronomical Observatory in Russia, when in 2007 he released his findings that for the previous 3 years the ice caps of Mars have been melting at an unprecedented rate. To the most chilling parts of these reports on the current instability of the African Tectonic Plate are those Russian scientists who assert, that, should a powerful enough gravitational force be exerted upon this region [such as that which would occur in our Earth¹s presence with a Planet X type body], it would cause this plate to be subsumed with the Atlantic and Indian Oceans completely covering what is now known as the African Continent, and further cause a corresponding rise of what were known to the ancient peoples as the Continents of Atlantis in the middle of the Atlantic Ocean and Lemuria in the Indian and Pacific Oceans. Interesting to note about these current events is that the most documented psychic of 20th century America, Edgar Cayce, predicted that both Atlantis and Lemuria would arise again during the ending of our Earth¹s present age, and which many in the World currently believe will be in 2012 as predicted by the Mayan Calendar. "Good evening. It is I, St Germain, and I come to congratulate you all. Well done, citizens of Planet Earth and indeed of the Universe. That which has been spoken of this evening is truth and there is more. You have co-created a marvelous canape of adventures and excitement, of wondrous historical times and of times not so joyful as you have indeed traveled upon Planet Earth and in other places. Your reward is NOW. Your return is NOW. We are speaking of your homecoming. We are speaking of your realization of this citizenship and the honoring of you for all that you have accomplished. You have enjoyed freedom the entire time though it may not seem so from your side of what little remains of the veil. You have all served as slaves, bound in some manner. You have all served in prisons. You have all suffered, been tortured and killed for your expressions, for your beliefs and for your cries for freedom. You have all been at some time or other what you might call Freedom Warriors. And if you think that those expressions were in vain, think again. Because of you, because of your efforts and your actions, you have kept the light of Freedom alive upon Planet Earth. Because you volunteered to be a Freedom Warrior, you are now a Peace Bringer to the planet. Lady Liberty stands ready to come fully upon the stage in all of her luminous glory and she does so with great joy and appreciation to all of you for what you have done. "Now I want to share with you a little bit more of the banking situation. As you all know, I have had many lifetimes and identities upon Planet Earth and other places, but what is important now is that I set up this Trust when I could look through the centuries, because when you have an ascended status you see past, present and future all as one. And I could see that I needed to start what I called a Freedom Fund, a way to enable freedom for the citizens of Planet Earth so that they would be free to follow their paths of joy. You see, the Earth evolved in such a way that when Lemuria was in full bloom, there was no such thing as money, nor was there need of it. But there became in actual usage, various mediums of exchange, items that were valued. Salt is a good example, and we are talking about true salt, not what the chemists have given as salt. And you have access to true salt today and it is rich for you. Gold - gold was much prized all over the planet. Not always as a medium of exchange, sometimes it is prized for its beauty and sometimes for its healing powers in a certain state, called the high-spin state, and so on. Gold has been prized upon this planet for a long time. It was the goal of certain ones, bankers and their families, to own all of the gold, and by doing so they felt certain they would own the planet. "So I started a fund. That fund is rich beyond what most of you can probably imagine, and thanks to the Kumaras of Venus and others from other places, we have brought in sufficient gold such that every man, woman and child upon the planet will have so much abundance that they will fast get to a place where they won't need it any more. Imagine. Just imagine. We have talked about the desert blooming. The people will bloom and thrive and prosper. "Gold has healing capabilities as do other precious metals. We have technologies to utilize in the form in which they can help people to heal, in which they can energize the planet, power the planet if you will. And yes, they can be used to create beauty, and just to sparkle and shine. If you want to wear it, if you want to decorate with it, if you want to pave your streets with it, except that there won't be much left in the way of streets, but rather walking paths, but you can decorate the streets with it anyway. Imagine unlimited gold and other precious items. Your bodies are changing to the crystalline bodies. Does that give you an idea of how precious your bodies are because you prize crystals as well as gold, and they are precious. And many people pay many dollars or gold to possess various crystals and here your body is becoming crystalline. "But there will be no need to weigh you and to say that your value is so much an ounce. Your bodies will be utilizing what you call the monatomic elements in the high-spin state, well let's just get right down to it, that's gold and other precious metals in a different state. You will have access to all of this and more because the truth of it is, it's all here. It's like the bank computers behind that curtain that we spoke of. They are all there and they are all ready and it's a matter of pushing a button and I, St. Germain, have my finger on that button at this moment. Lady Master Nada is leading off with the activities at The Hague. And we ask that you empower these activities in any way that you feel most comfortable doing. Many of you are familiar with the healing of Ho'oponopono - it's very simple. Many of you are starting to get to your Q-tipping in the Q-tipping way. Q-tipping the Q-tipped areas and you know that you might have a little bit of anger or resentment toward those you call the dark hats or the Illuminati on their leaving the stage. Long ago Ashtar spoke of the man just at the edge of the stage, back stage, with the hook, to take anyone off the stage that the audience was not appreciating, that is, did not appreciate the actions of the players upon the stage. 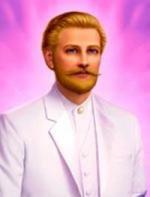 "And if you can do that, Beloved Ones, you are living the teachings that I, St Germain, the one you call Jeshua, Sananda, the Buddha and all of the others have brought to Planet Earth. So now get ready, you might wish to give a standing ovation to those who are leaving, and you might wish to leap for joy as the curtain is about to re-open on that which you call the Golden Age, the Age of Aquarius, Lemuria Living. Thank you, Beloved Ones, for being with us in this great venture. It is you who have made it possible for the Bank of St. Germain to open in this grand time on Planet Earth. "And so it is. Namaste."